The past week Iv'e been busy helping with different projects. These are the shields I've sewn . 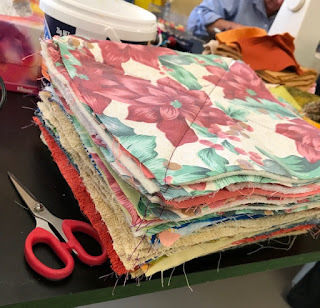 Wednesday after the parade and service for ANZAC Day it was time to sew-a-long at The Empty Bobbin doing blocks for the Homeless Quilts Project. Thursday was sewing at Patch and I 'm still working On Ringo Lake. I feel like there is no end to that Mystery Quilt !!!!! Fridays I'm off to Building Better Bones , Saturday was a 5th birthday party for my Great Grandson. Sew I'm happy to have finished my "Holly Christmas Cottage " quilt for OPAM. That WAS a busy week! I swear, you accomplish more in a week than I might in a month! Oh my goodness you have been a busy busy girl! Enjoy! Love the finish on the Christmas quilt--and what a busy fun filled week with all those projects and friends working together for good charities!! It sounds like you are keeping out of trouble with all of your busyness!! lol I love your Holly Cottage finish. The colors are so pretty. Your pads and blocks are nice donations too. Great idea. Yes, Ringo Lake is definitely a long term project, but you will love it. Happy belated birthday to the big boy. How much longer will you be able to bob before it gets too chilly? My goodness, you are a busy person, aren't you! So kind of you to do all that charity sewing. Love your Christmas quilt. It's lovely to see your gorgeous AHCC quilt here too :-) You are very busy with all your charitable sewing - good on you diverting so much energy to help so many others. Your community seems to be a really strong one. I can't believe your great GS has turned 5 already - it doesn't seem that long ago that you were telling us that he had arrived! You are so busy. Lovely quilt. 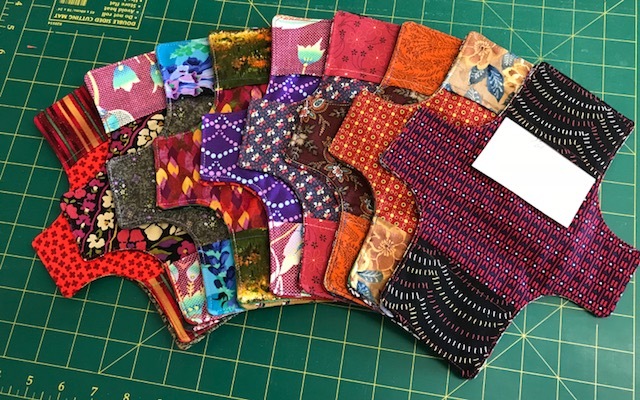 Wow so much on the go, love your quilt. Hi Maria... oh I do so love your Holly Cottage Christmas, it's just gorgeous, I'm so pleased for you. You've been very busy. Your Christmas quilt is very pretty. I like the subdued look without a bunch of bright red and green everywhere.